How does IVR / Auto Attendant work? 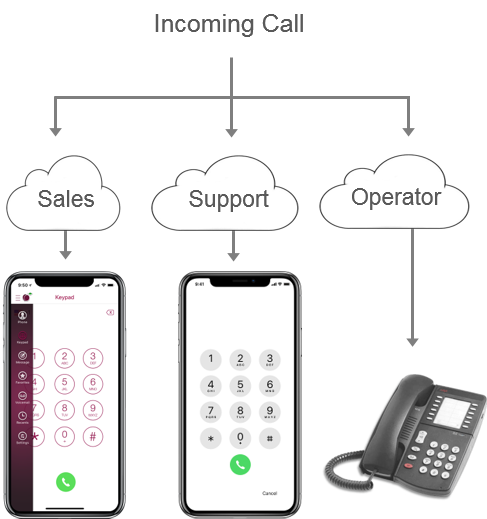 You can add next generation cloud based phone system features like voice menu that plays a greeting and allows callers to dial an extension. You can be a business with multiple employees or a solo professional. It is light weight with self setup. Where to enable Auto Attendant? Click IVR / Auto Attendant. Configure greeting & extensions as per your requirements See example below. Create greeting with one extension routing calls to the iPlum app on your mobile phone. Create greeting with one extension routing calls directly to iPlum voicemail. Create greeting with one extension routing to a one external number. Create greeting with one extension routing to multiple numbers (iPlum or external). Create greeting with multiple extensions routing to one number (iPlum or external). Create greeting with multiple extensions routing to multiple numbers (iPlum or external). Create greeting with multiple extensions routing to directory & departments. Create call-tree with multiple levels of IVR / Auto Attendants. Initially dial an external number, if unanswered send the call to iPlum voicemail. Initially dial iPlum number, if unanswered send the call to an external answering service. Set Business hours: Do-Not-Disturb option. Play announcements like hours of operation, directions, special instructions & more. These are advanced options which define various timers and count options. Most options you will keep them at their default values. Maximum length of extension digits. Example: If you will be using call extensions like 1,2,3 ..9, you set this value to 1. If you will be using extensions like 101, 102, 103 etc, you will set this value to 3. Number of times to play greeting before disconnecting. We suggest to keep it at default count = 3. Ring time interval between sequential numbers. We suggest to keep it at default time = 18 seconds. Display Caller ID. Choose between Origination Number (default) or the iPlum Number. Get Real-time Call Notifications in iPlum App. Check this option if you want to get an alert in your iPlum app whenever there is a incoming call to the iPlum number where Auto Attendant is setup irrespective if the caller selected any extension after listening to the greeting. Which Caller-ID will show for inbound iPlum calls? You can choose to show the Call Origination Number (default settings) or your iPlum Number as the display Caller-ID on the call receiving devices. This option is available in Auto Attendant Settings. Can I show my main iPlum number in outbound iPlum calls for multiple users in my iPlum account ? Welcome and thank you for reaching Mary’s consulting where we design beautiful houses. Please press one to reach Mary. Ext 1 ; Send Call to iPlum App. It is advisable to keep other timers and counts with their default values. Welcome and thank you for call Law Firm of Houston. Please press one to leave a message. Our associate will contact you within one business day. Ext 1 ; Route to Main Voicemail. Ext 1 ; Call Single Phone Number. Enter either iPlum phone number or an external number. Important Note: Within iPlum Call Flow, you have the flexibility to configure your extensions to ring to iPlum numbers or external numbers. When you give users their own iPlum numbers and install them as 2nd line on their phone, the users will know that this is an iPlum related call with distinct ringtone & visual screen. For adding more iPlum numbers in your primary iPlum account use the option “Additional Line” in Dashboard. Welcome and thank you for reaching Joe Design consulting. Please press one to reach a sales agent or press zero to reach the operator. Ext 1 ; Call Multiple Numbers – Sequential Ringing OR Simultaneous Ringing ; Enter iPlum numbers or external phone numbers or mix of both which you want to ring when caller presses option 1. Ext 0 ; Route to Main Voicemail. Welcome and thank you for reaching John’s Architecture Company where we help to build office buildings. Press two zero one for new clients, two zero two for design support, two zero three for material support, two zero four for billing and zero to reach operator. Press nine to repeat this menu. Ext 201 ; Call Single Phone Number. Enter an iPlum phone number or external number. Ext 202 ; Call Single Phone Number. Enter an iPlum phone number or external number. Ext 203 ; Call Single Phone Number. Enter an iPlum phone number or external number. Ext 204 ; Call Single Phone Number. Enter an iPlum phone number or external number. Ext 9 ; Repeat Greeting. Welcome and thank you for reaching APP corporation where we help clients with office supplies. Please press one for sales or two for support. To leave a voicemail press zero. Press nine to repeat these options. Ext 1 ; Multiple Numbers – Sequential Ringing OR Simultaneous Ringing ; Enter multiple iPlum numbers or external phone numbers or mix of both which you want to ring when caller presses 1. Ext 2 ; Multiple Numbers – Sequential Ringing OR Simultaneous Ringing ; Enter multiple iPlum numbers or external phone numbers or mix of both which you want to ring when caller presses 2. When you get users their own iPlum numbers and install them as 2nd line on their phone, the users will know that this is an iPlum related call with distinct ringtone & visual screen. For adding iPlum numbers in your primary iPlum account use the option “Additional Line” in Dashboard. Welcome and thank you for reaching Ivory Coast Mortgage company where we help you with financing. If you know the extension of the person you are trying to reach please enter it now or press one for an available sales agent, two for customer service and zero to leave a voicemail. Press nine to repeat this menu. Ext 101 ; Call Single Phone Number. Enter Bob’s iPlum number or his external phone number. Ext 102 ; Call Single Phone Number. Enter Mary’s iPlum number or her external phone number. Ext 103 ; Call Single Phone Number. Enter Debra’s iPlum number or her external phone number. Example: A business has multiple subsidiaries each with its own set of extensions. Each iPlum account can have only one auto-attendant. Please create different iPlum accounts with their own Auto Attendant & then connect them. The caller will dial the main number, hear the greeting, choose the subsidiary and then dial the extension. Create iPlum Primary account with main Auto Attendant. Setup separate iPlum accounts for each subsidiary with their own Auto Attendants. In the Primary account’s Auto Attendant “Call-flow” extension setup, add Subsidiary iPlum numbers (which have their own IVR / Auto Attendants). Setup extension with “Multiple Numbers – Sequential Ringing”. Put your external number first and add your iPlum number as the last number for that extension. Further you can configure “Do Not Disturb” for that iPlum number (using Utilities in Dashboard) so that the call will directly go to the voicemail without ringing again. Note: If external number is switched off or you manually dismiss the call on the external number or the external number has too little rings, the device on that number will force the call to its local voicemail. In the default iPlum Advanced Settings for Sequential Ringing, the call needs to ring 18 sec on 1st external line before it will rollover to next line (voicemail in this case). You can reduce this Sequential Ringing time in Advanced Settings . You can also call your external number carrier and increase number of rings there so that iPlum voicemail comes up without the call going to your external number voicemail. Setup extension with “Multiple Numbers – Sequential Ringing”. Put your iPlum number first & then the answering service phone number. The call will first ring on your iPlum number and if you don’t answer, it will roll over to the external answering service. Note: This option is available when the extension is configured to an iPlum number. It is not available when call is transferred to an external number. Example: You want to take customer calls from 8 AM – 5 PM and automatically route them to voicemail in after-hours and weekends. Go to Utilities || Do Not Disturb || Select Line || Enable Call Ringing DND (and/or Text & Notifications) || Set Daily Hours. Here you can setup hours when you don’t want to receive the customer calls/text. 5 PM to 8 AM each day and all day Saturday/Sunday. During after-hours or weekends when any caller dials your iPlum number, they will hear an Auto Attendant greeting and then after caller presses the extension, it will simply send teh call to the voicemail on the iPlum number configured for that extension without disturbing you. One can change business hours both in iPlum portal & iPlum app. Play announcements like hours of operation, directions, special instructions. Choose an Extension ; Play Announcement. Type your announcement. How to setup iPlum number online? How to setup your main iPlum number to ring multiple phones or users?